Can You Survive in the Antarctic? recorded. Winds on Antarctica have been recorded up to 200 miles an hour. conditions make survival on this continent a constant struggle. chills will average around -100 degrees F.
back. While not reaching their destination, Shackelton's team did survive. the team members confined to their tents for days on end. out to be a relatively easy round trip. ponies died, forcing the members of the expedition to pull their own sleds. companions were found eight months later frozen to death. shelter from the elements, clothing, food, and water. energy or calorie-rich food and wear specially insulated clothing. feet and warm protective gloves or mittens on their hands. important as food, is obtained by melting snow. effect of hypothermia is a progressive inability to think clearly. The human body is remarkable at maintaining a constant body temperature. heat; it preserves the heat generated by the body. conditions chill the body so that it loses heat faster than it produces it. 1-A person feels cold and has to exercise to get warm. 2-The person starts to shiver and feel numb. becomes sluggish and the mind starts to wander. know where they are and what is going on. respiration rates are noticeably slowed. cease to function and heartbeat becomes erratic. 9-Heart and respiration centers of the brain cease functioning. four treatment must be immediate. 1-Get the victim out of the cold, wind, and rain. 2-Remove all wet clothes and put on warm ones. exercise. It is important that the core temperature be elevated quickly. b-Keep the victim from getting any colder and send someone for help. 1- C - keep your clothes CLEAN. 2- O - avoid OVERHEATING (sweating). 3- L - wear your clothes LAYERED and LOOSE. body heat loss. Carry a good wool cap. 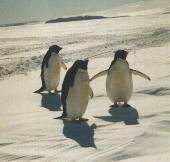 Antarctic and where they live. 5-The student will be able to describe treatments for hypothermia. in a winter survival situation. Antarctic explorers have found themselves in. supplies being used on the Trans-Antarctica Expedition. given a winter survival situation. activity sheet "Coat for an Ice Cube." activity sheet "Is Staying Dry Important in Winter Survival?." storm. Then ask them what they would do. Possibly give them some choices. All this is found in Activity #1.
for more than one answer. serve as reference material for students completing this activity. WHAT IS IT LIKE IN ANTARCTICA? Low temperature: -129 degrees F.
Average summer temperature: -50 degrees F. to 20 degrees F.
-Low temperature: -41 degrees F.
to be a relatively easy round trip. the first time men have crossed Antarctica the long way. water is obtained by melting snow. and an insulated outer shell. clothing system is layer by layer. The first layer is thermal underwear. mukluks on their feet and warm protective gloves or mittens on their hands. Many of us lack the knowledge required for survival in a cold environment. enough even on a cold winter day. results in severe frostbite, and in some cases, death. provide heat; it preserves the heat generated by the body. hypothermia occurs at temperatures between 30 and 50 degrees F.
knows where they are and what is going on. 2-Remove all wet clothes and put warm on warm ones. feet are cold, put on your hat." MINNESOTA WINTER - COULD YOU SURVIVE IT? 40 knots of wind. You are in a four-door car on an ice-spotted highway. prefer. How many said you'd rather be alone? Two in the car? Three? Four? Five? More than five? Remember the choices you made. -How many would try to drive the car out of the ditch? -How hard would you try to drive the car out of the ditch? -How many would elect to stay stuck? them) to get out and push? -Who would do that? Who would not? -What would you rather have in your trunk, a shovel or a sleeping bag? -How many for the shovel? -How many for the sleeping bag? -How would you get the sleeping bag out of the trunk? -How many would keep everyone in the car? -How many of you would shut off the engine right away? -How many would keep it running? -Suppose you had a candle and a book of matches in the glove compartment. Would the candle be better to keep you warm than the car heater? -Who's for the car heater? -Which would you rather have to consume? -In the front and back seat? -What would you do with the sleeping bag? -Suppose the blizzard lasts 30 hours? -The gas runs out, the candle burns out, the food or liquid is consumed. How many people would you ask to come along? -A box of crackers and a roll of salami? -A pint jar of whipped honey and can of pop? -Ask someone to push and drive out. -Try to dig out with a shovel. -Bring the sleeping bag from the trunk. -Try to flag down a car with a flashlight. -Send someone for help or go yourself. -Have all stay in the car? -The jar of whipped honey and can of pop. -All huddle together and try to go to sleep. -Try to do something to keep awake? Get into groups of four and arrive at a consensus for the score sheet. Prepare to defend your group's answers. Antarctica or trying to survive a Minnesota winter. balance or weight scale to find the weight of the ice cube. 2-Wrap the ice cube in your cloth or covering material. volume or weight just like you did in #1 above. down volume or weight by the starting volume or weight. better at keeping in the cold. percentage of ice left was so good? IS STAYING DRY IMPORTANT IN WINTER SURVIVAL? Pencil, graph paper, thermometer, ice, large container for ice water. down in the data table. stand outside in the cold air. information into the data table in the same column. the column "difference from air temp." submerge it into the ice water. this information into the data table in the same column. table under the column, "difference from water temp." 9-Plot on the graph, as a line, the difference from air temperature number. - 0 degrees. Plot horizontally the time in seconds from 0 - 240 seconds. Use - 0 - for air, and - X - for water. 1-Is body heat lost faster when skin is exposed to air (dry) or water? 2-Is staying dry important in winter survival? car. The trunk may be jammed by collision or buried in a snowdrift. -Bright red or orange cloth for signal banner, face mask, first aid. -Matches and candles (stubs of dinner candles). -Small, sharp knife (kitchen paring knife is OK). -Facial tissues, kitchen towels, toilet paper, or paper towels. -Quarter taped to cover for phone call. -Canned solid fuel or fuel tablets. case to avoid accidental switching or burnout). -Water (tea, pop, bottled water). 2-Pack the following items outside the can somewhere in the car. paper milk cartons to spread in front of slipping rear wheels. 4-The first obvious symptom of hypothermia (exposure) is what? 5-Who was the first man to reach the South Pole? 6-Which Antarctic explorer died on his way back from the South Pole? 7-What is the Trans-Antarctica Expedition using to get across Antarctica? 1-Tight-fitting clothes are warmer than loose fitting clothes. 1-If put in a winter survival situation, what do you need to consider? 2-What should you put into a Winter Survival Kit?